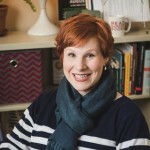 On April 8, the American Library Association (ALA) released The State of America’s Libraries Report 2019, an annual summary of library trends released during National Library Week, April 7–13, that outlines statistics and issues affecting all types of libraries. This report includes a snapshot of censorship in libraries, schools and universities: who initiates challenges, where are they taking place, and what are the reasons? The ALA Office for Intellectual Freedom tracked 347 challenges to library, school and university materials and services in 2018. View the full list of reasons at ala.org/bbooks/top. Find social media cover photos, images to share, infographics, coloring sheets, and a complete PowerPoint slide deck of the Top 11 on the Free Downloads webpage. Share content from OIF’s social media pages; Facebook, Twitter or YouTube. Join the conversation by using and following hashtags #NationalLibraryWeek and #Top11. The Advocate: America’s Most Banned Book, George, Is about a Trans Girl. 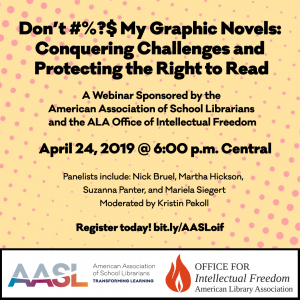 To celebrate School Library Month, AASL has gathered banned author Nick Bruel and school librarians to tell their stories of challenges to graphic novels and comics. Traditionally ALA releases a top 10 list of banned and challenged books within The State of America’s Libraries report. This year 11 books were selected, since two titles were tied for the final position on the list, and both books were burned by a religious activist to protest a Pride event. Shining a light on censorship in America’s libraries makes our communities strong and ultimately makes our country stronger. 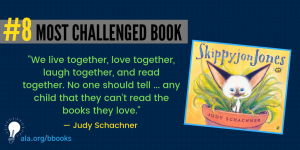 Help us defend the right to read these stories and so many others.